The Cheltenham Gold Cup is always the highlight of the Cheltenham Festival and that is certainly the case this season with any number of horses being backed for big race glory. If the race was a popularity contest, though, there is no doubt that Cue Card would be the winner with the horse and trainer Colin Tizzard amongst the most popular in the sport now. 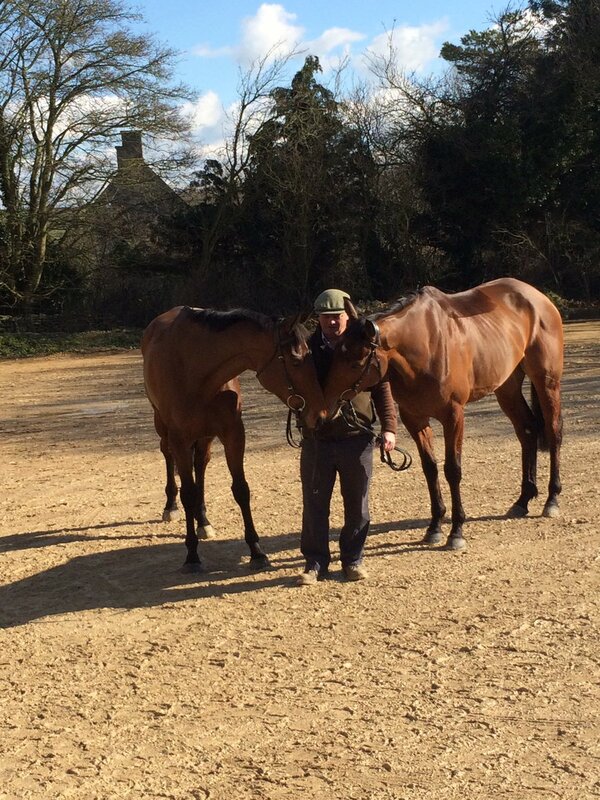 Colin Tizzard invited the racing media to his new scenic yard down in Dorset on Thursday morning and there is no doubt who stole the show as Tizzard waxed lyrical about his stable star, Cue Card. "He ran away with the Champion Bumper, he ran away with the Ryanair Chase. He owes us nothing, we have been pushing him for years." Cue Card and Colin Tizzard have already had a season to remember with a stunning win in the Betfair Chase and an even more remarkable win in the King George at Kempton in the bank which means they are just one Gold Cup win away from a place in history, and the £1million bonus that goes with winning those three races together in the same season. Its quite clear though that although the £1million bonus would be welcome to Tizzard, this mission is all about winning the Gold Cup. "The money is fantastic, a lovely idea for the stable staff and i would be able to pay off part of my mortgage with it but money goes, winning the Gold Cup would be the pinnacle for a trainer." Cue Card might be a Betfair Chase and a King George winner this season but according to the market he is still only 4th best with 6/1 still available about the dual Festival winner. One or two clearly still have doubts about his ability to stay the extra Gold Cup trip but Tizzard has no such worries following his Kempton win on Boxing Day. "It took Cue Card all of the 3m at Kempton to get past Vautour. He was off the bridle but once he got there, he was really staying on through the line. He's brilliant around Cheltenham, he's a stone better at Cheltenham than Kempton." Tizzard confirmed in a confident manner. The facilities at Spurles Farm in Dorset are certainly impressive, with the Tizzard team moving to their new yard at the start of the season from Venn Farm and so far it appears to be paying dividends for a trainer who has already surpassed his best ever season when it comes to prize money. "What we wanted to do was get away from people saying i'm a farmer who trains a few horses, so now we have made a statement (with the new facilities) that we are a training yard." This is by no means a one horse operation, with the emergence of Thistlecrack, this season, perhaps just as big as a story as that of Cue Card. Unbeaten this term, Thistlecrack was a stunning winner of the Cleeve Hurdle back in January and he will go to the World Hurdle as a red hot favourite and one of the home bankers for many punters. Tizzard appeared very proud to parade Thistlecrack in front of the media and he was bullish about his chances of running a rig race in the newly named Ryanair World Hurdle next month. "They all have to pick up to beat him. He (Thistlecrack) has been absolutely brilliant in his last five runs." Tizzard continued. "There doesn't appear to be any bottom to him at the moment." There has already been talk of Thistlecrack trying to emulate Coneygree next season by trying to win the Gold Cup as a novice which tells us everything we need to know about how highly this horse is rated by the team down at Spurles Farm. "He's not five (Thistlecrack) is he? Now is the time, you wouldn't go novice chasing with him otherwise he'd be 10 (when he ran in a Gold Cup), otherwise you would stay the World Hurdle route. The Gold Cup is everyone's aim in life i would say." Tizzard confirmed to the assembled media. The quality of Thistlecrack and Cue Card are without question but there is a lot on the line for a relatively small yard and the next couple of weeks will be nervy as they aim to get their stable stars fit and well for the biggest races of their lives. "I am feeling the pressure," Tizzard explained. "It makes me feel nervous just talking about it (Cheltenham). As long as we can do the same thing we have done all season, we should be fine though." You wouldn't know Tizzard was feeling the pressure to talk to him though as he approaches the biggest week of his training career with everything clearly in perspective. It hasn't always been easy for him with the trainer recalling his time at school when he was one of just two pupils to claim a free lunch but times have changed now with the carrot of a £1million bonus hanging right in front of the team. The Cheltenham Festival is often dominated by the major trainers in the sport like Willie Mullins, Paul Nicholls or Nicky Henderson but this year it could belong to Colin Tizzard who will head to Prestbury Park with two horses of the very highest quality and no one would begrudge the Dorset handler a famous double success at the Festival.